Although Robert Nabke already had undergraduate and graduate degrees under his belt, he realized he would need the hands-on technical experience provided by an associate degree to change to a career in advanced manufacturing. “It was humbling to realize that I would need to return to college for technical training,” he says. Now Robert is using an associate degree in Supply-Chain Management from Greenville Technical College along with the BMW Scholars program to build a new career at BMW Manufacturing Company. The BMW Scholars program allows students to attend class full-time at local community colleges while working part-time at BMW in order to further their education, gain the necessary hands-on experience, and become viable candidates for full-time positions at BMW. During this process, BMW will offer tuition assistance toward obtaining a two-year associate degree. The associate degree from Greenville Technical College and participation in the BMW Scholars program are providing Robert with a strong future. SAP, short for Systems, Applications & Products in Data Processing, is the market leader in enterprise application software. The system links all business processes together and provides management with information for decision making in real time. Understanding that today’s manufacturing success is driven by highly technical processes and complex relationships with suppliers and customers, Greenville Technical College (GTC) has fully incorporated SAP into the college’s Supply-Chain Management program. SAP is used by diverse companies such as BMW, Milliken, ScanSource, Fluor, Hubbell, Bosch and Greenville Health System. This widespread use of SAP creates a variety of job openings for those proficient in the system. Upon completion of these courses, the student receives a SAP University Alliance certificate of completion. The BMW Scholars program, an option for students in several manufacturing-related programs in addition to the Supply-Chain Management program, prepares students for employment and equips them with SAP skills. Opportunities for those with SAP knowledge should continue to grow as the state’s economy flourishes. 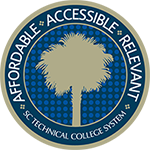 In 2015, South Carolina’s technical colleges graduated over 500 students with commercial driver’s licenses. Of those 500 graduates, approximately 100 were from Florence-Darlington Technical College (FDTC). 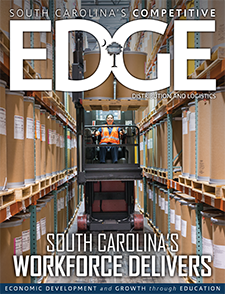 As the largest South Carolina CDL training program, FDTC boasts a 100 percent job placement rate for its graduates. The Logistics certificate program at Orangeburg-Calhoun Technical College (OCtech) introduces students to both logistics and the fundamentals of management. The program familiarizes students with order fulfillment and inventory control through enterprise resource planning (ERP) and the college’s Festo Didactic modular production system (MPS), a simulated production line with a warehousing component designed to educate students in automation technology and flexible manufacturing. Festo’s MPS uses robots and automated guided vehicles to move product through assembly, into the warehouse for storage and out of the warehouse for shipment. This unique coursework prepares students for careers in distribution, transportation, warehousing, trucking operations, supply chain and manufacturing organizations. Students who complete the program are encouraged to seek the Manufacturing Skill Standards Council foundational-level Certified Logistics Associate and mid-level Certified Logistics Technician certificates. Thanks to a generous donation from Milliken & Company, Spartanburg Community College (SCC) began a new truck driver training program in November 2017 for a profession that offers both competitive wages and job security. Milliken donated a 53-foot trailer to SCC that will be used to train students enrolled in the College’s new commercial driver’s license (CDL) or truck driver training program. J. Harold Chandler, CEO, president and chairman of the board of Milliken & Company, presented SCC president Henry C. Giles with the trailer at the college’s central campus in Spartanburg.